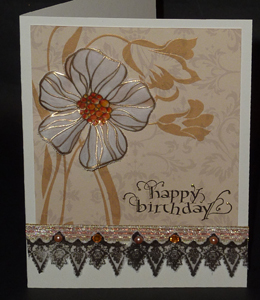 This card was made especially with Jan Marie from Flourishes in mind. Happy Birthday Jan Marie. Hope you're having a great one. I used a lace border from the "Lace Edges" set #86 from Flourishes on vellum and used a Pergamano 2 hole piercer to perforate the edges. The large flower is from Hero Arts "Blossom Arts" set also stamped on Vellum and embossed with gold, then used a Pergamano embossing technique starting with a large balled stylus and working down to a smaller stylus to create the white color within each petal and to give it a very 3D effect. The center portion was colored with Bic alcohol markers. It was also pierced around the edges to perforate. I\m using a Quietfire Design Happy Birthday stamp that I just love and you've seen me use a lot. Anyway, to see more details and descriptions, just click on card image and enjoy. Stampin 4 the Weekend #4 Bingo: Ribbon/bows, Glitter, Flowers; Pearls, Lace, Polkadots; Pink, BFlies, Die Cuts. I agree! the happy birthday stamp is fab! Gorgeous Yogi! Love the gold shimmer and fancy trim! Very beautiful card, love the embossing on the flower,well just everything you did on the flower, it is wonderful. Thanks for joining us at Lexi's Creations this fortnight! What a gorgeous birthday card. I love the flower you created. Such a pretty card.. Thanks so much for playing along with us at CCCB! Fabulous card, thanks for playing along with us at CCCB! Oh I love this card. The lacy border and the gold highlights on the flower. Thank you for playing along with us at Freshly Brewed Challenges. Forgot I was wearing 2 DT hats, Yogi. Also want to thank you for playing at Lexi's Creations this time. Beautiful! !! Thanks for joining us at CCCB! Lovely card. Thanks for joining us at FRESHLY BREWED CHALLENGES. What a stunning and very elegant card! Simply gorgeous! Thank you for joining Freshly Brewed Challenges for our Double it challenge!